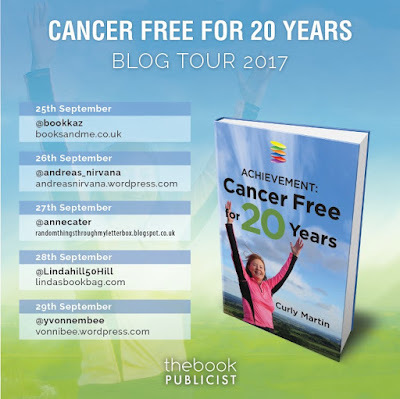 Extremely delighted to be hosting the inspiring Curly Martin today for a guest post as the Blog Tour for this fascinating and informative book gets under way. It is an extremely thought provoking read and full of so much comfort and guidance to those who need it, no matter what illness they are going through. 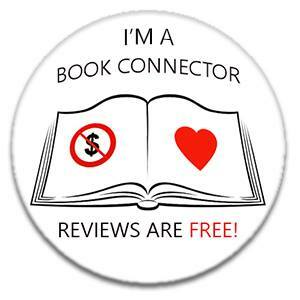 There really is something for everyone in this honest and uplifting book. In 1992, Curly Martin was diagnosed with terminal cancer and given 9 months to live. Whilst going through the conventional route of surgery, chemotherapy and radiotherapy she decided she would try to beat the odds that were so heavily stacked against her. Her journey exploring what alternatives were on offer led her to experience some the wilder side of cancer therapies. Curly started with massage and make-up whilst in hospital. Every day she would plaster her face with false tan cream so that she looked healthy, even if underneath she was incredibly pale skinned. She took up the offer of free massage, and this was a major turning point into the alternative therapy world. Although Curly had been told by doctors that her cancer was terminal, she realised that there were things she could do to increase her odds of survival beyond the 9 months she had been given. In her mind, she was going to die anyway, so why not take a punt on therapies that aren’t scientifically proven? She launched herself into exploring everything that was on offer and found a mushroom-based Kombuca tea, which was actually more like fungi yeast that was prepared in a bucket. In her book, Achievement: Cancer Free for 20 Years she talks about the link between tea and cancer treatment, including the story of a woman who claimed to have cured herself of breast cancer through a formula she obtained from an Ojibway Indian, known as Essiac tea. Curly found the ingredients and recipe, then made and drank cups of the Essiac tea daily for over 2 years. Part of her journey was spent studying Neuro Linguistic Programming, and one of the interventions was called the Museum Of Old Beliefs. Through this technique she had to imagine entering a museum, walking up the stairs to an attic and putting her negative cancer beliefs into a large trunk, locking it and walking away. During her studies, Curly also read that mercury in dental fillings had been implicated as a possible causing factor in cancer growth. She subsequently had all of her many mercury fillings removed and replaced with composite filling, all without anaesthetic injections, instead using a powerful mind game to manage the pain. Today, Curly has been cancer-free for more than 20 years, but still has her “Daily Dozen,” or twelve things she does every day, inspired by her cancer journey. These include walking, taking vitamins and minerals, “I CAN-tations”, eating fruit, restricting coffee and alcohol, self-massage, drinking lots of water, eating a pescatarian diet, reducing sugar intake, setting daily goals and finally, only using chemical-free skin creams. 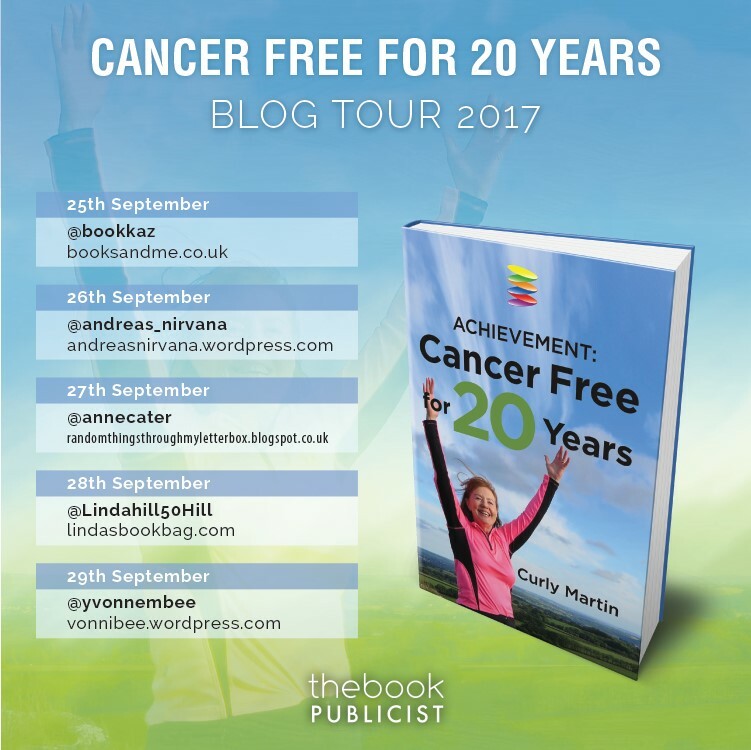 Curly Martin, is the author of Cancer Free for 20 Years. Given 9 months to live, Curly was homeless and dealing with a relationship break up. 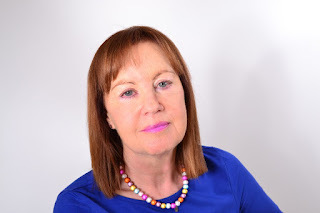 Twenty years on she has an exciting new career in coaching and is a best-selling author and International speaker. Her book gives guidance to others facing similar challenges. 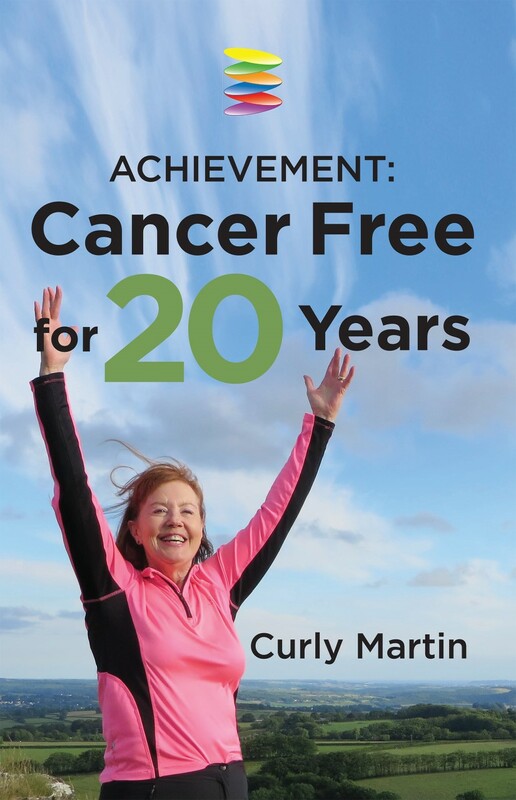 Achievement: Cancer Free for 20 Years by Curly Martin is out now, available from Amazon, priced £13.48. For more information go to www.achievementspecialists.co.uk. Thank you Curly, and thank you all for stopping by today! 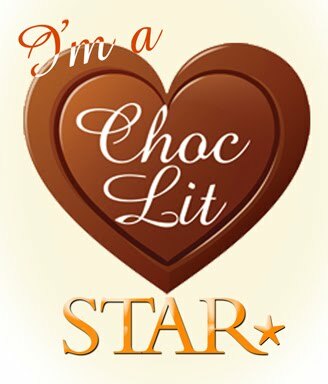 I hope you'll be checking out the other stops on the Blog Tour over the next few days for more info! !